The Aguinaldo issues are often referred to as the "Katipunan" or "First Republic" issues. These issues were the postal and fiscal stamps issued by the Republicans under the leadership of General Emilio Aguinaldo. The Filipino Republic was instituted by Aguinaldo on June 23, 1898, at this time assuming the office of President. The Filipinos, under Aguinaldo's leadership, had organised a Government which remained in force during the time of the overthrow of the Spanish Power in the Philippines; the Fall of Manila' and after hostilities had broken out between the Filipinos and the Americans on February 4, 1899. For at least ten months, the Filipinos were under control of neither the Spanish or American Authorities, but acknowledged the leadership and presidency of Aguinaldo. His Revolutionary Government had become recognised throughout the islands, except for Manila and some sea-ports still held by the Spaniards, such as Zamboanga. In those ten months, civil governments were established, a native army was organised, telegraph lines which had been destroyed during the insurrection were repaired, a postal system had begun, and a stamp tax enforced. In fact, all the basic steps had been taken towards the goal of a free Nation. Aguinaldo was taken prisoner by United States troops on March 23, 1901. The devices composing the National Arms, adopted by the Filipino Revolutionary Government, are emblems of the Katipunan origin. 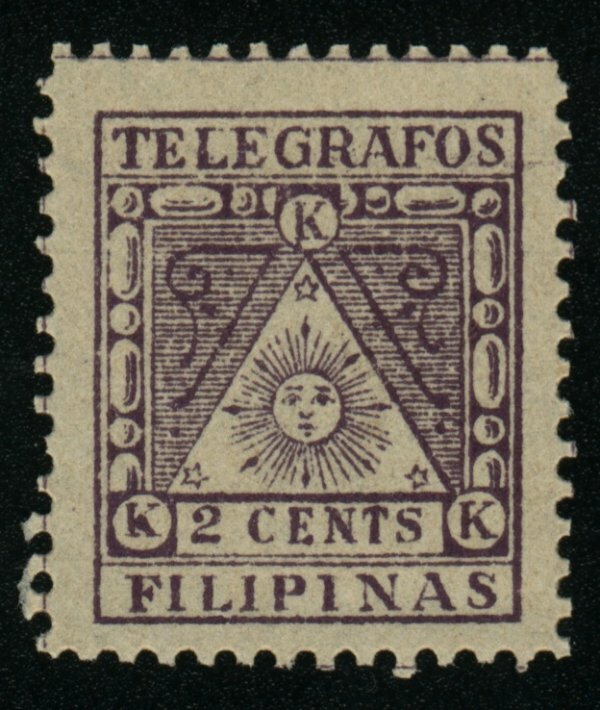 The letters "KKK", which appear on the stamps, are the initials of this society whose complete name is "Kataas-taasang, Kagalang-galang Katipunan ng mga Anak ng Bayan", translated to mean "Soveriegn Worshipful Association of the Sons of the Country". 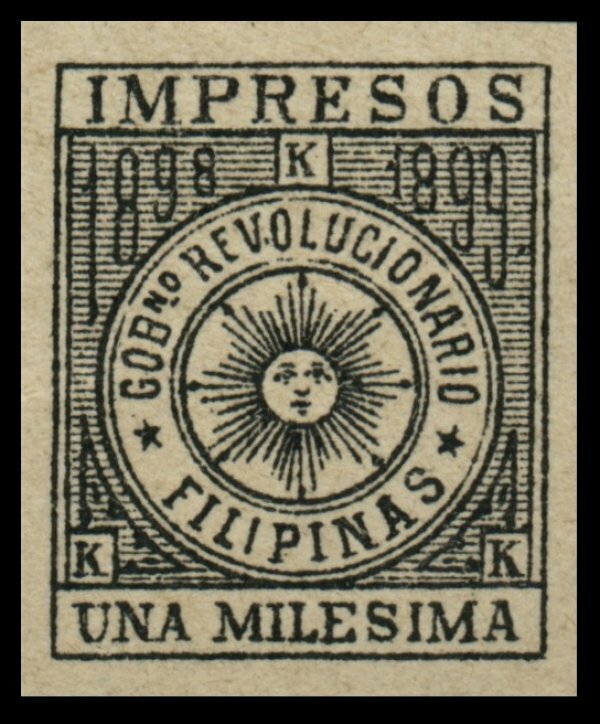 Whilst the Revolutionary Government did not, at any time, actually occupy Manila, they were recognised as being in charge of certain areas, and their postage stamps were also recognised as having postal validity in the areas which they did control. 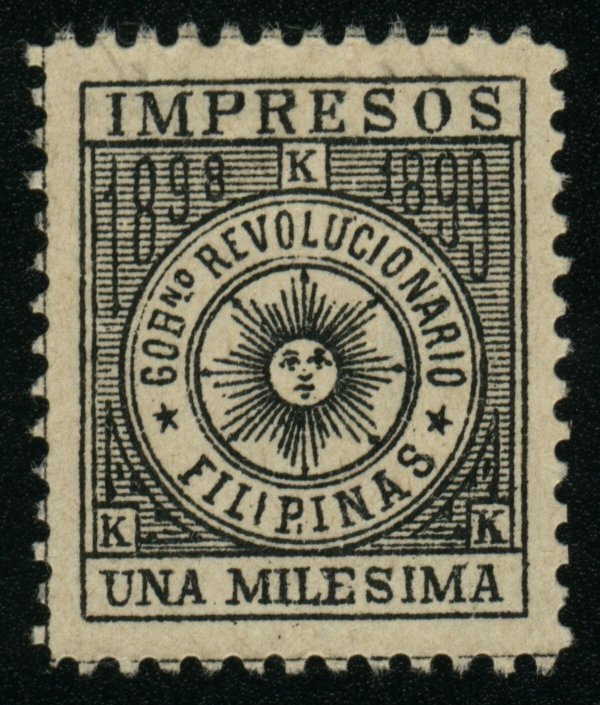 An effort was made at Malolos, in September 1898, to issue the needed stamps for all governmental purposes, but the facilities were found inadequate. On November 2, 1898, a decree was issued formalising the Revolutionary Postal and Telegraph Service. A contract was made with a firm of lithographers in Manila by whom all the stamps actually issued and used were made. As correspondence with the insurgents rendered one liable to suspicion in the eyes of the American Authorities at all times, especially after the outbreak in February 1899, it is probable that hasty preparation and the necessity for secrecy and taking advantage of special opportunities for sending out supplies will go far to account for the part perforate, imperforate, and sometimes ungummed sheets sent out for use before being completed; some of which were used while others were found among supplies later captured by the Americans. There can be no possible doubt that all the stamp issues were in actual use for the purposes intended. Used copies are quite scarce in all cases, and in some are quite rare. The reason for this is that practically all correspondence bearing these issues were destroyed by the recipients, lest it being found in their possession would be used as proof of complicity in the Insurrection, and would subject them to punishment. All the stamps in this series were printed in sheets of a single pane and without any marginal legend. The stamps were all lithographed by the Lithographia del Gomes in Santa Cruz, Manila. All stamps, with the exception of the imperforate varieties, are perforated 11½ and along the colored lines separating the stamps. All the stamps, except the third type of "CORREOS" stamp were issued in 1898; however, exact dates of issue and quantities are not known. 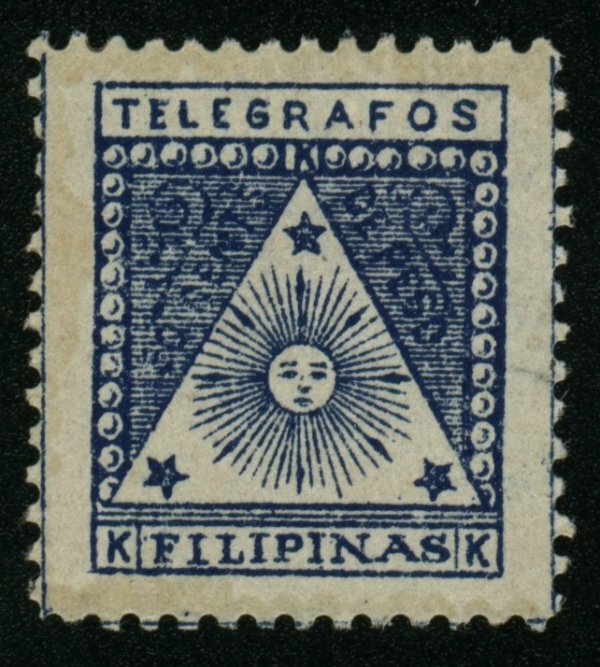 The regular postage and telegraph stamps were in use on Luzon as early as November 10, 1898. Owing to the fact that stamps for the different purposes were not always available together with a lack of proper instructions, any of the adhesives were permitted to be used in the place of the other. Hence telegraph and revenue stamps were accepted for postage and postage stamps for revenue or telegraph charges. Both stamps were printed in sheets of 192 stamps, (16 rows of 12 stamps each). A total of 19,000 stamps were printed for each value. The 2c value exists in shades of violet and the 50c in shades of blue. Printed in sheets of 153 stamps, (9 rows of 17 stamps each), and exist in shades of red-brown. No records are available to indicate the actual number of stamps printed.